America is not America without Muslims. As people of faith and moral conscience, we promise to defend our Muslim brothers and sisters from attack, to speak up when they are maligned, and to support them with our voices, our actions, and our bodies. We’re going to send this letter and a copy of the signatories to the media, as well as to as many mosques and Muslim community centers as possible. Together, thousands of us can speak up and battle hate with love. This moment calls for a clear response to the vicious and absurd suggestion that we should close our borders to Muslims. 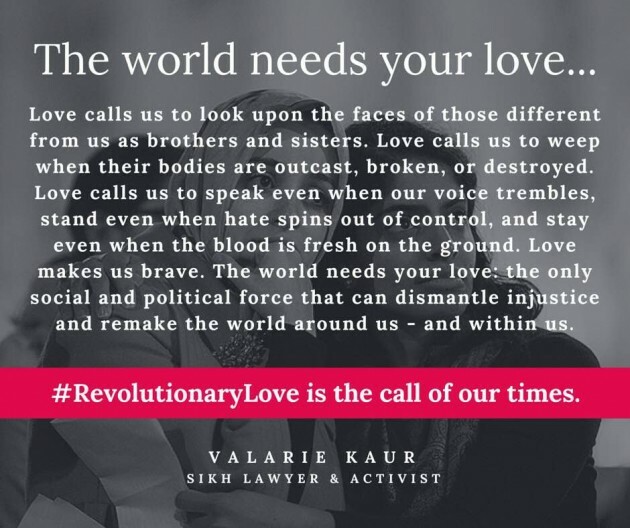 In place of such dangerous rhetoric, we offer instead “revolutionary love” for our Muslim brothers and sisters, for the Constitution, and for our country. We commit to choosing love over fear with both our words and our actions: through speaking out against bigotry and showing our respect for Islam and love for Muslim Americans in all parts of our lives — in the pulpit, in the classroom, in the street, at the kitchen table, in the voting booth. This is our pledge. There can be no bystanders anymore. In a few years, people will ask — where were you during this time? What did you say? What did you do? How did you respond? When they ask, what will you say?